At Kalamazoo Smiles, our family dentist has years of experience in all manner of dental work. From fillings to root canal therapy, our team can do it all. 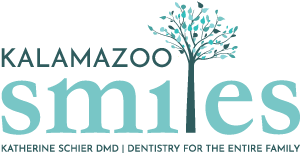 Click the links below to explore a few more resources about our Kalamazoo, MI dental practice and see how we can help. We’re always happy to talk with you to determine your oral health needs and outline what we can do to help. Contact us today with any questions you may have. To make an appointment with our Kalamazoo, MI cosmetic dentist at Kalamazoo Smiles, visit our contact page or give us a call at (269) 353-3700 to make an appointment. Dr. Katherine Schier is our Kalamazoo dentist with experience in both family dentistry and cosmetic dentistry. At Kalamazoo Smiles, we want your first visit to our office to be a welcome one where we can establish a lasting relationship. At your first visit, we will discuss any areas of concern you may have and what your dental goals may be. Have questions for our dentist in Kalamazoo, MI? Dr. Katherine Schier understands that patients often have questions between appointments. Check out our list of frequently asked questions below to learn how to maintain a healthy smile. we can share it with all of our patients.